The grand opening of the Canopy by Hilton Reykjavik City Centre on Sunday, June 5, 2016 also marked the worldwide debut of the first hotel property of the Canopy brand — and I had the opportunity to stay in one of its 110 guest rooms during my first night in Iceland after a day of exploring the southern peninsula of the country. 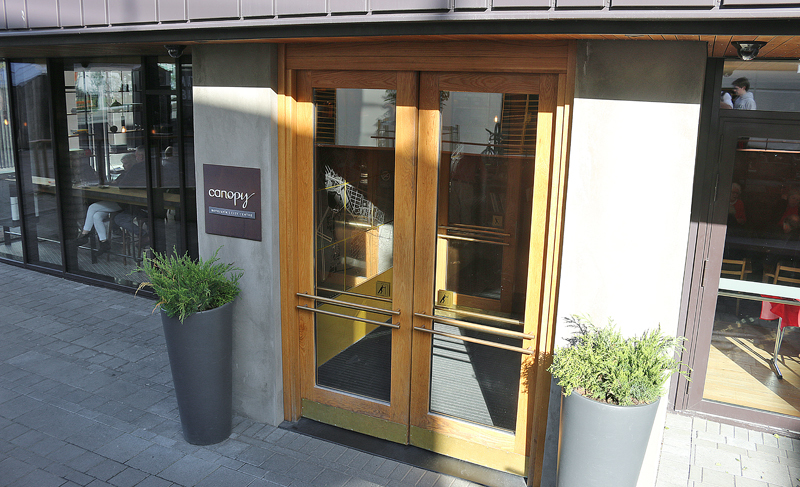 This is probably the most extensive and detailed review of a Canopy by Hilton hotel property — which includes at least 63 photographs — so please be advised that this review is lengthy. 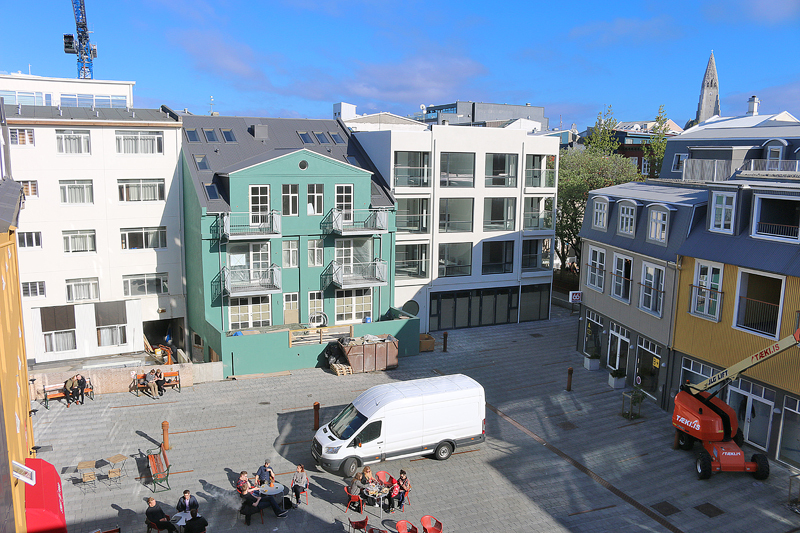 The hotel property is set across six connected houses near the center of Reykjavik. No sign appears at the top of the main building; so the only way you know you are at the hotel property is by the signage located at street level. 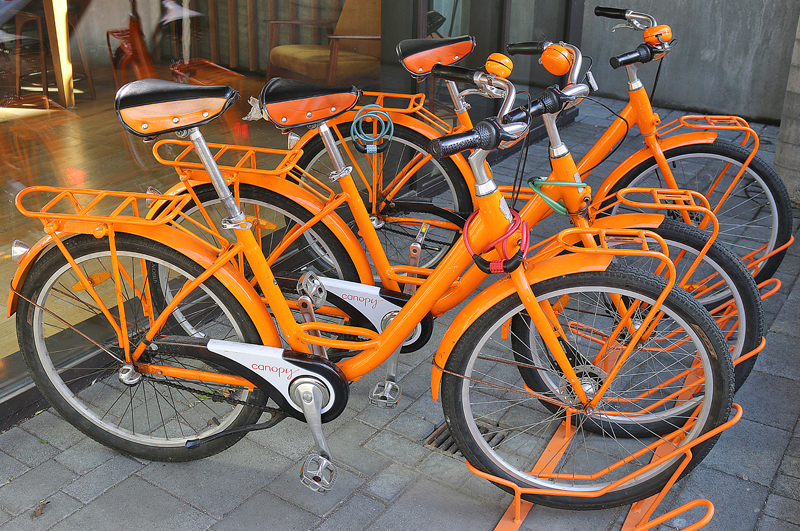 Located behind the signage are bicycles, which are adorned with the Canopy logo and signature orange color and are available just outside the entrance to the hotel property for use by guests free of charge. Entering the interior of the hotel property was sometimes a chore, as the doors were not aligned and therefore sometimes difficult to push or pull. To the right of the entrance is the front desk, where employees — who are known as Enthusiasts — will check you in and out of the hotel property; and they are also available to answer any questions which you might have. 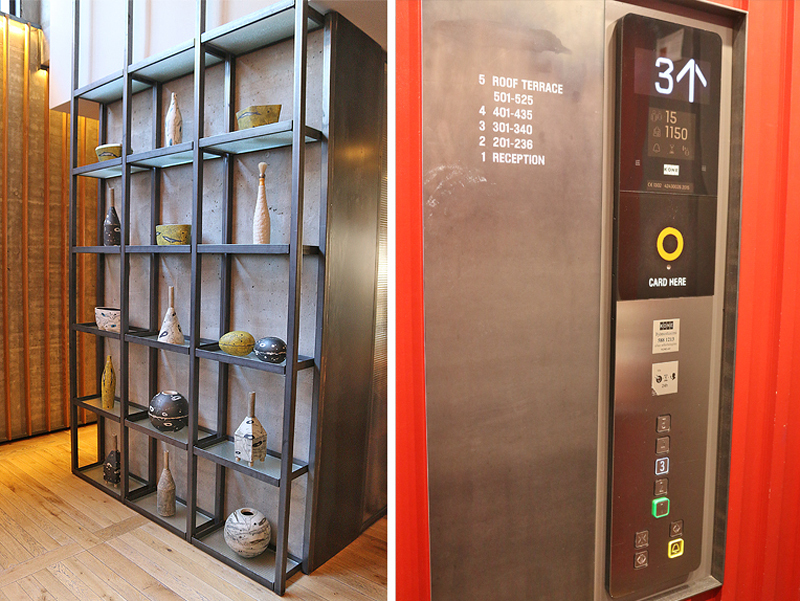 One notices immediately that this lobby is not your typical stale corporate hotel property. There is a feel of being in a comfortable place which is part of the neighborhood. …although water is available at the far end of the bar. This place is known as the lounge area. Photographs ©2018 by Brian Cohen. 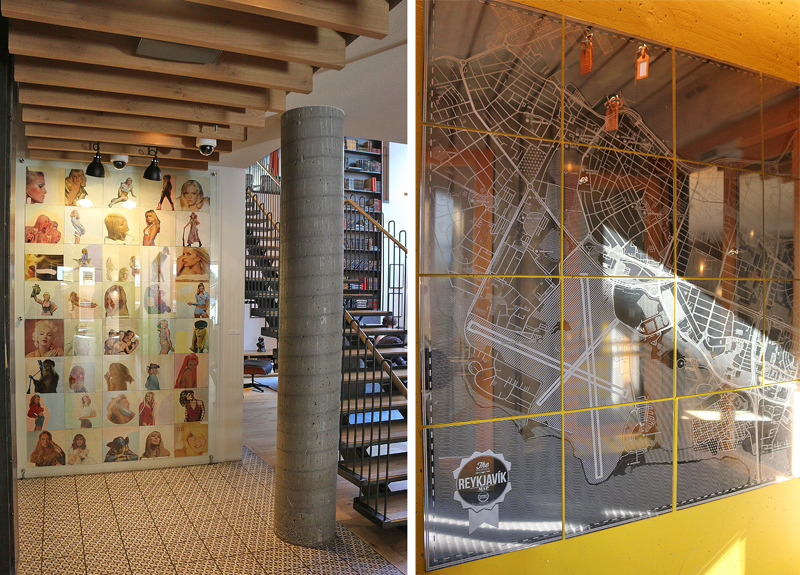 Upon walking further into the lobby, a stylized glass map of Reykjavik appears — along with some nostalgic retro are on the walls. Next to the staircase is a library with a reading area, which is stocked with books. What appears to be a fireplace on what is known as the Poetry Wall was not in use because the weather was quite mild. Can you find the elevators in this photograph? 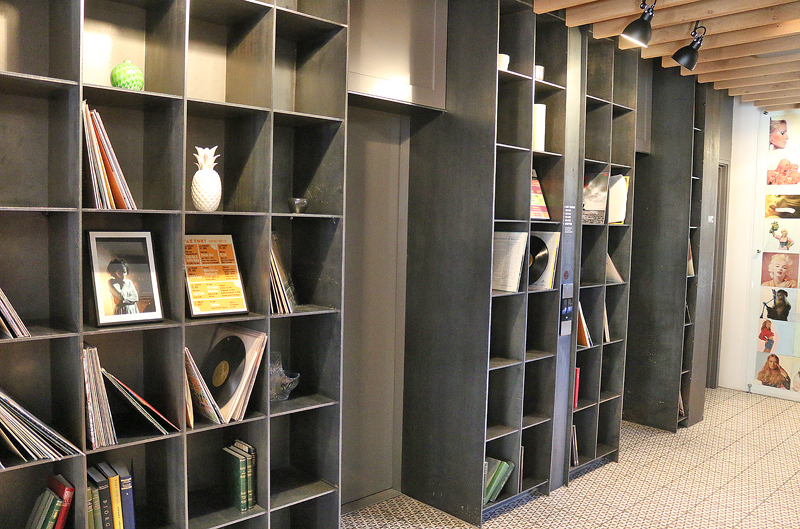 Finding the elevators — as well as the buttons to press to call them — was a chore at first because their location was not immediately obvious due to being obscured by the bookcases which contained old record albums. 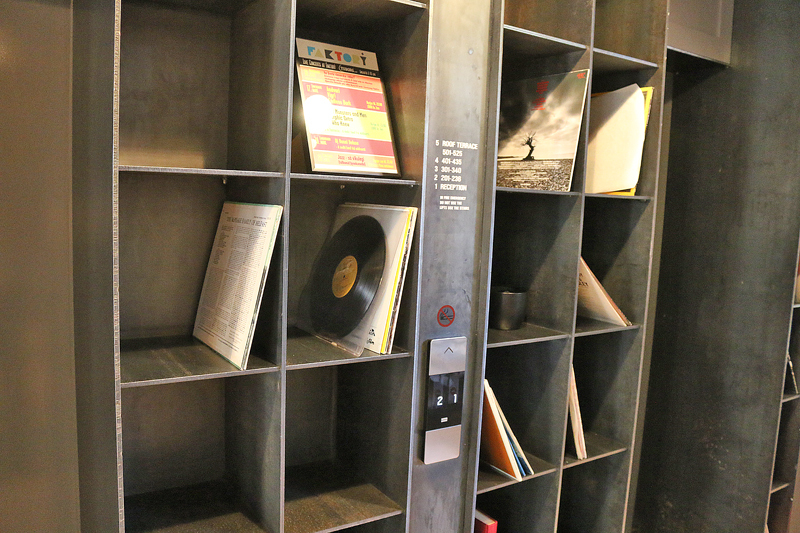 You can ask a member of the staff of the hotel property for one of ten complimentary turntables as you pick a favorite vinyl album from the extensive library of the café and enjoy the music in the comfort of your room. More Icelandic arts and crafts are on shelves in the lobby area near the elevator. The color of the walls on the inside of the elevator was the signature Canopy orange; and the building is comprised of only five floors. I walked down the hallway to my room. The hook below the room number is where a bag containing your breakfast will be hung if you prefer not to dine in the restaurant. It’s a curious journey, this human life we lead. 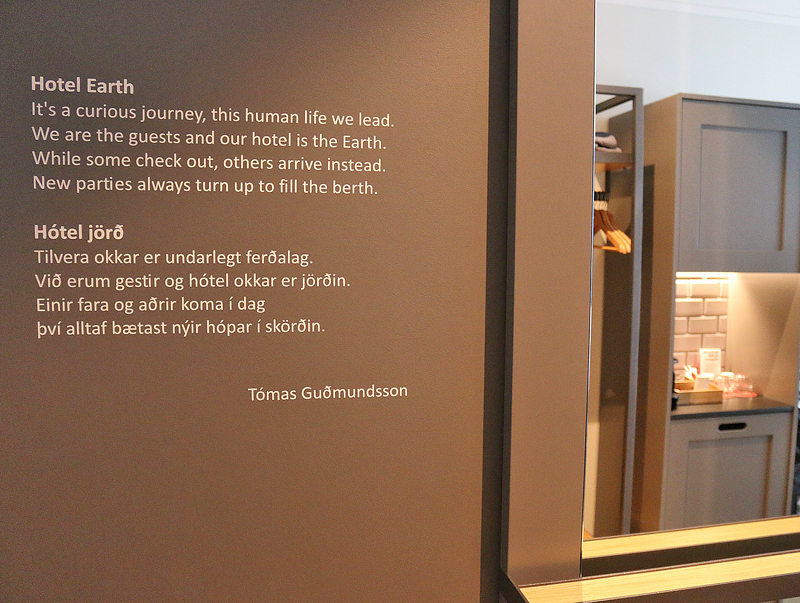 We are the guests and our hotel is the Earth. While some check out, others arrive instead. New parties always turn up to fill the berth. Each mattress is outfitted with a ZoneActive 5-Zone Foam Topper — with gel memory foam — and Serta Cool Balance Technology, for the right amount of support and temperature control. 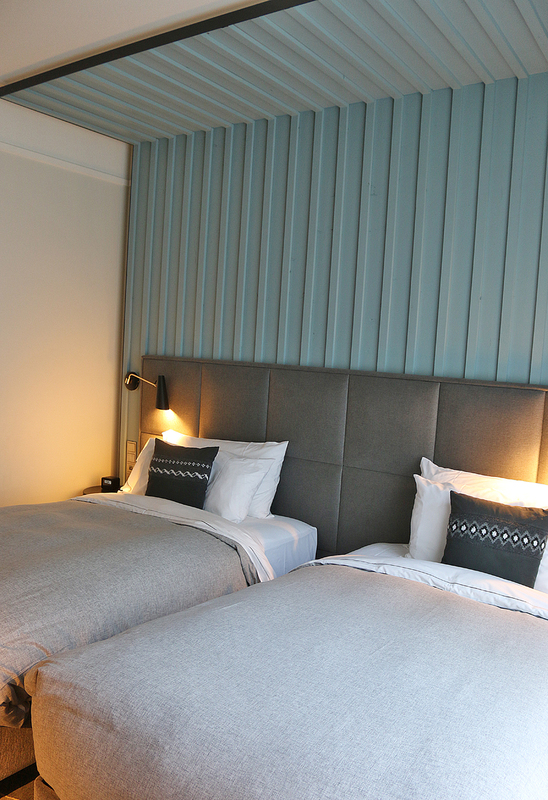 The bedding is created just for Canopy by Hilton, with a signature wooden canopy under which you can sleep. 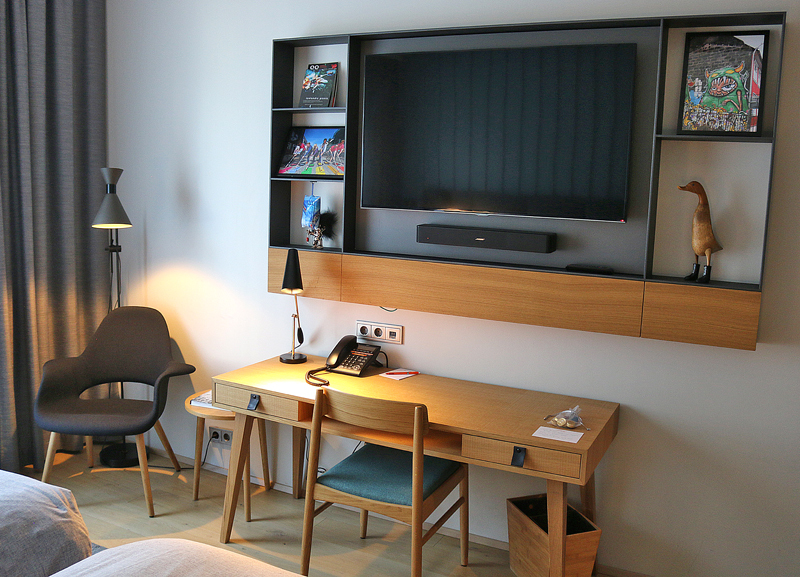 Each room has a flat-screen television which measures 48 inches and is hung on the wall, surrounded by artwork and textiles inspired by Reykjavik. Below that is a basic desk and chair with a telephone and lamp. Every guest receives a gift; and mine awaited me on the desk. Mine was assorted chocolates in a bag — which I enjoyed — and a guide to Reykjavik, which I unfortunately found to be of little use to me. The wooden storage space with metal supports is known as the “uncloseted” rack, which includes an ironing board, hangars and drawers. A rack for shoes is located at the bottom. To the left of the “uncloseted” rack is an area which contains supplies for enjoying a cup of tea or coffee, along with a machine for brewing coffee. In the cabinet above this space is an electric teapot. Below this space are both a safe and a miniature refrigerator. 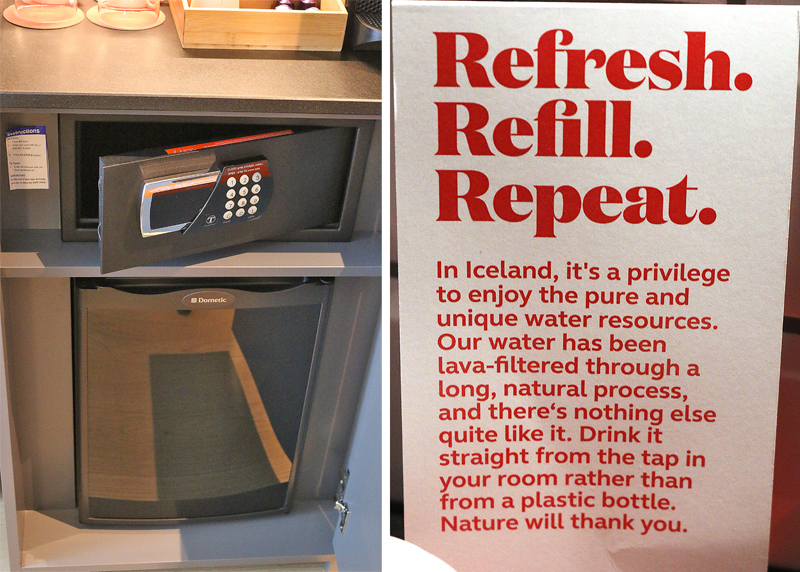 Behind the cups was a placard which extolled the virtues of Icelandic water, which I found to be good. A chair and small wooden table are located between the desk and the window. 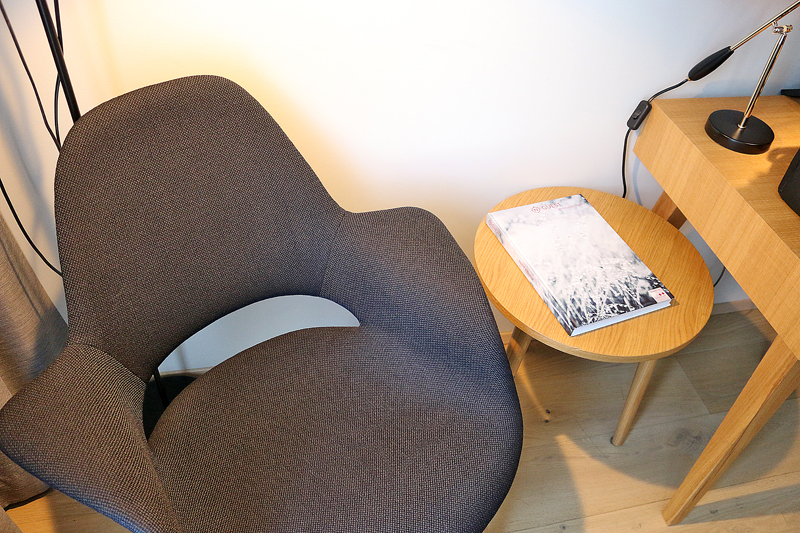 On the table was a — what else — coffee table book with information pertaining to Reykjavik. Rather than slippers, each Canopy room contains two pairs of soft thick socks with rubberized soles for traction to prevent slipping. 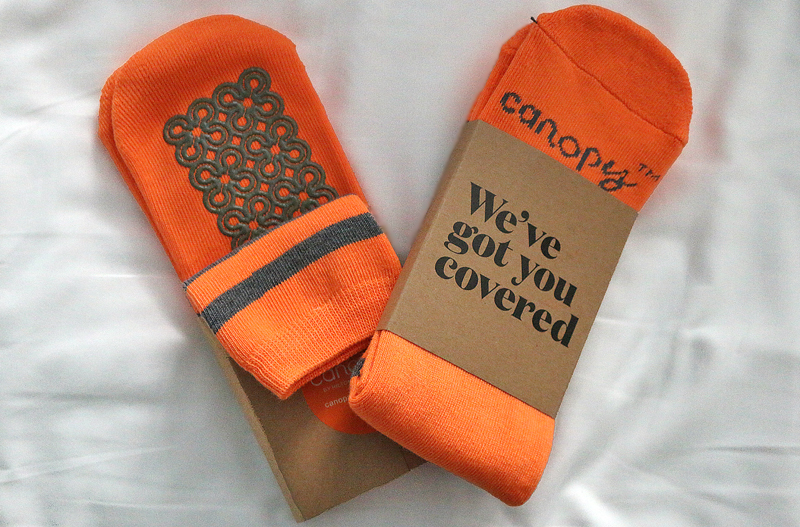 The socks are colored the signature Canopy orange and stored in cardboard sleeves which state that “We’ve got you covered”. Guests are encouraged to take and keep the socks. Each Canopy room also contains two gray robes — but they are not terry cloth; and instead of hanging in the bathroom, they are folded and stored in one of the drawers of the “uncloseted” rack. 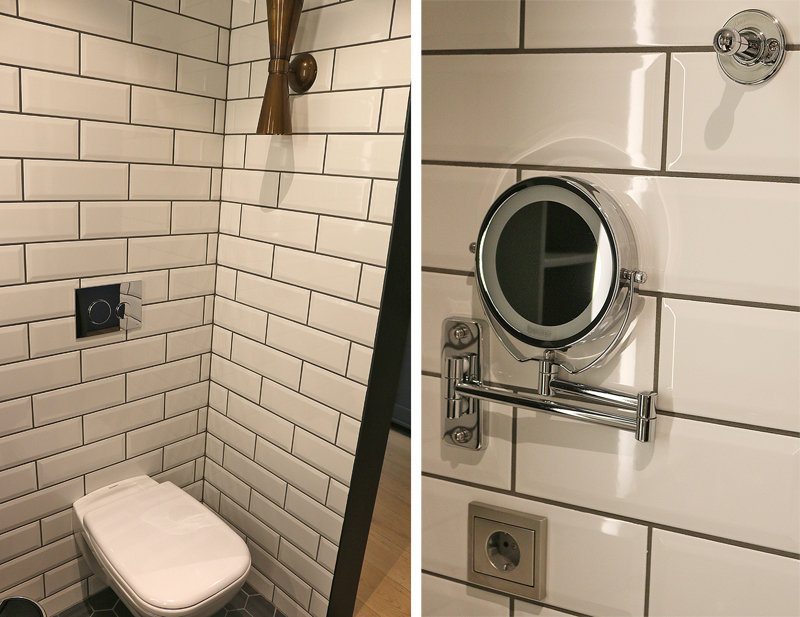 White subway tile surrounds the walls of the bathroom, which has a stylish yet utilitarian look to it. 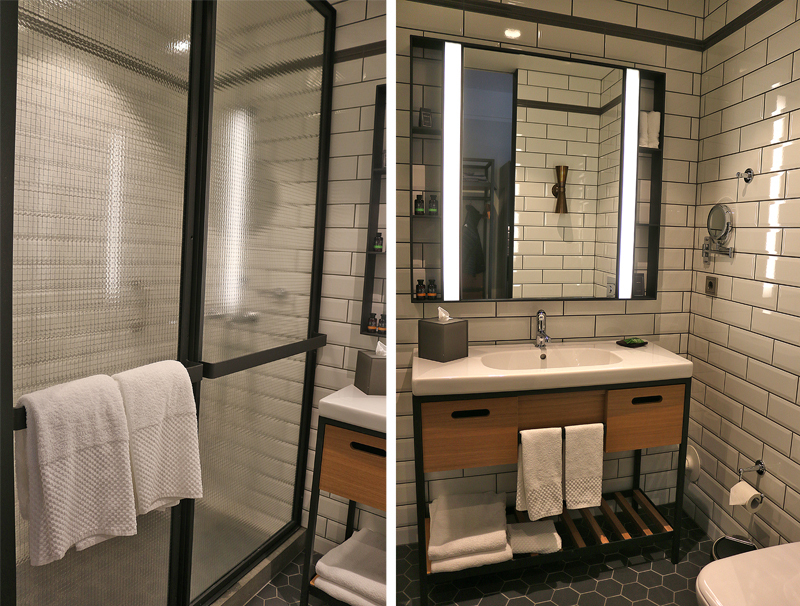 Amenities found in the bathroom included products by Apivita — including Greek honey and mountain tea shower gel and body milk; Greek honey and orange shampoo and conditioner; a shower cap; a vanity kit; and a bar of olive natural soap. 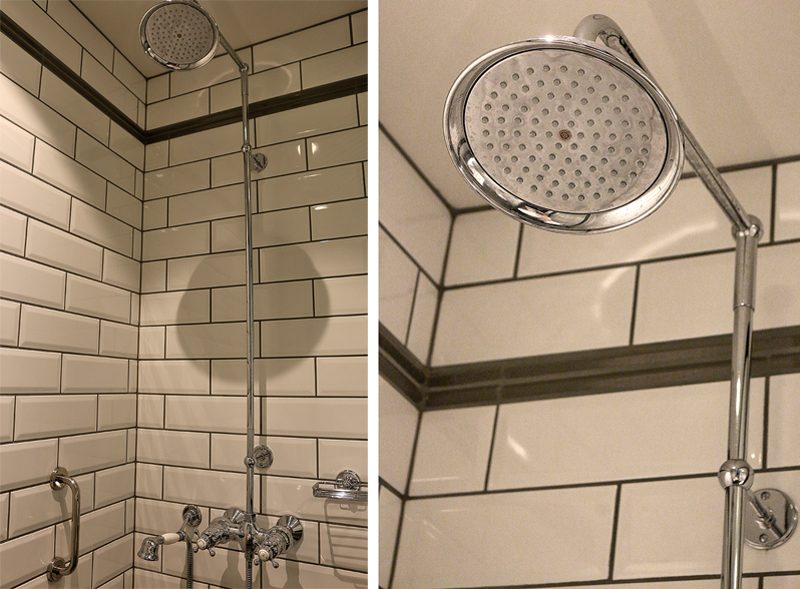 In addition to a rainfall shower head, the bathroom consisted of the usual things one would find in a hotel room. 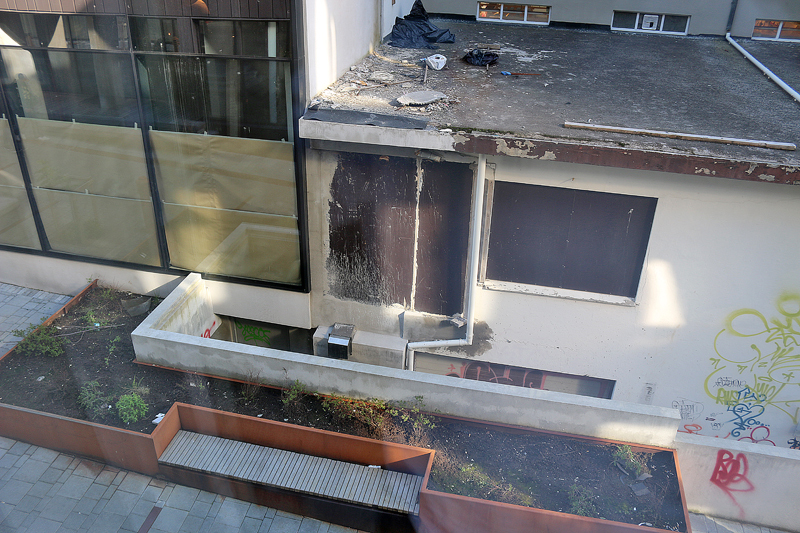 …as well as what appeared to be some type of construction. Looking up, I saw grey buildings. The exterior structures of four historical homes were carefully preserved to help create the unique building design of the hotel property. The Roof Terrace is located on the fifth floor of the hotel property. …and the mountains of the Snæfellsnes Peninsula in the background, enshrouded by clouds. 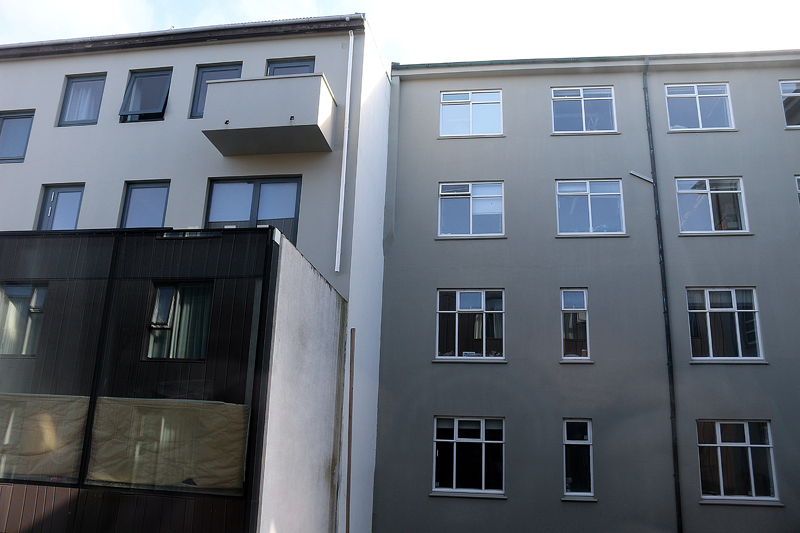 Reykyavik is a clean and quaint city; and it is the northernmost capital city in the world. 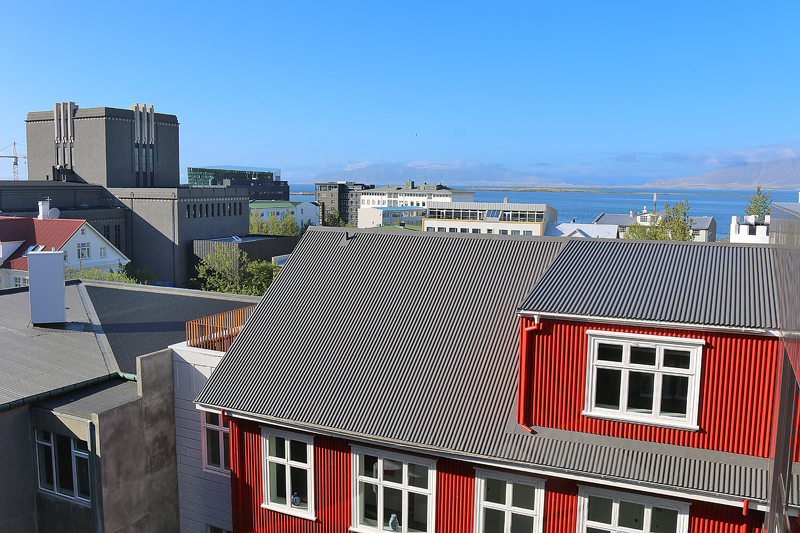 People walk along the city streets of Reykjavik, which is considered to be one of the safest cities in the world. During the month of June, the city experiences as much as 21 hours of sunlight — although the sun never really completely sets at this time of year. Along with a view of the remainder of the hotel property, seeing the Aurora Borealis or northern lights from the Roof Terrace is possible in the months from October through March. 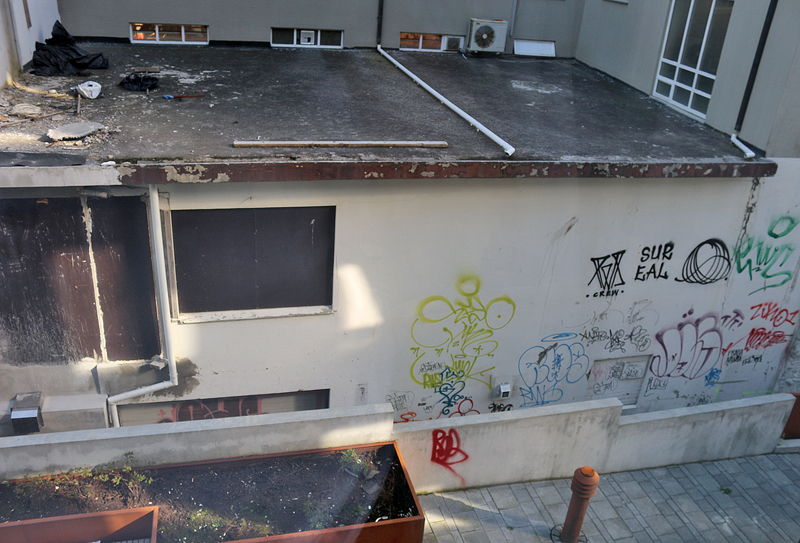 The view on the other end of the Roof Terrace is of the courtyard which was known as the Heart Park, as it was considered to be a community oasis where creativity grew. In the distance, you can see the steeple of Hallgrímskirkja, which is the largest church in Iceland. 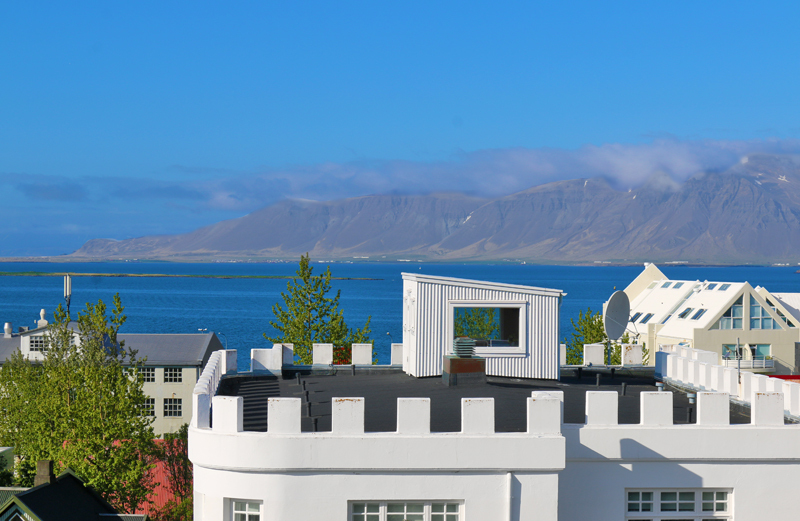 …and the sculpture known as Waterfall #3 by Theresa Himmer on the roof terrace — which is shown in the photograph below — is a depiction celebrating the pure water of Iceland, which has many waterfalls. This waterless fall cascades through the roof with a cameo appearance on the fourth and third floors. …to enter the Geiri Smart restaurant. The local artisanal breakfast is complimentary to all guests and includes a wide assortment of delicious food items. Smoked salmon, salad items, assorted bread products, cheeses, cold meats, and different kinds of spreads are found in the area closest to the entrance of the restaurant. 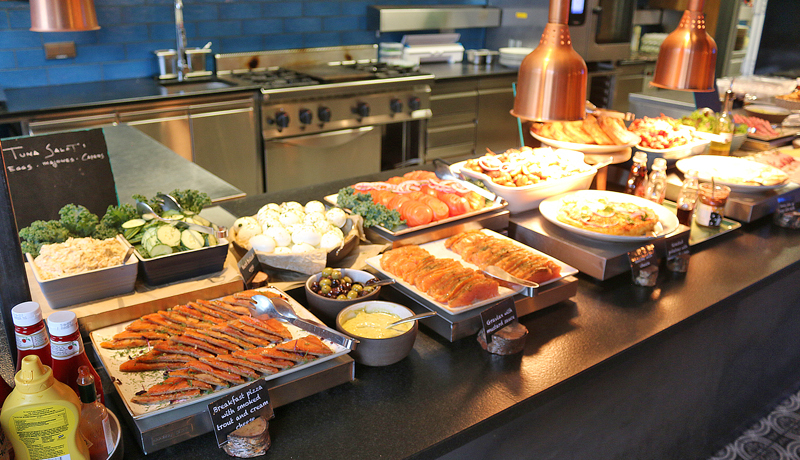 Items such as breakfast pizza with smoked trout and cream cheese, tuna salad, olives and assorted condiments are available. I tried the Canopy signature wellness beverage. I am not sure as to what were the ingredients; but I was not too thrilled with the taste. Assorted fruits and juices, pastries, yogurt and skyr, and eggs were also offered as part of the breakfast buffet. Other breakfast offerings included oatmeal with granola and berries; different types of cold cereals; and different types of toppings and milk. 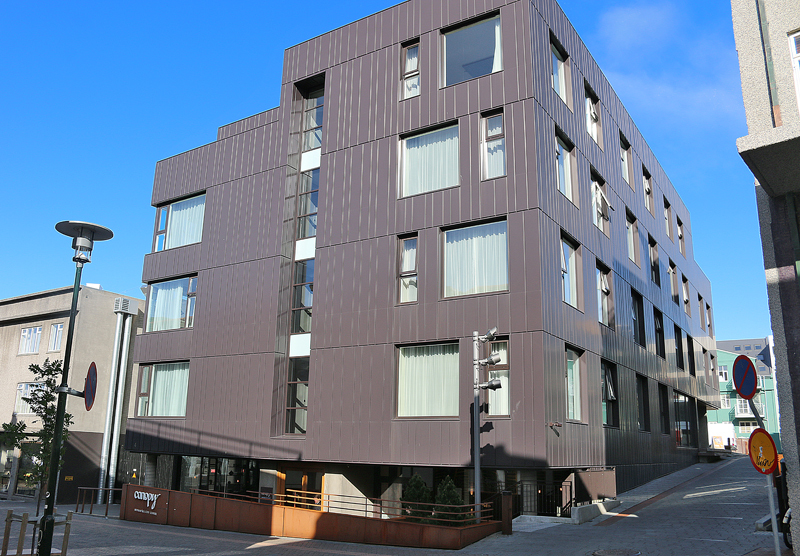 I found my stay at the Canopy by Hilton Reykjavik City Centre to be comfortable and relaxing, with friendly members of the staff of the hotel to be helpful with answering questions. The complimentary breakfast buffet is very much appreciated in a country where food can be ridiculously expensive — and it is included in the room rate for all guests. I was not upgraded to a suite due to limited availability, which was fine by me — but know that other than a chance for an upgrade of your room, elite level status in the Hilton Honors frequent guest loyalty program means little at a Canopy by Hilton hotel property, as all guests receive virtually the same aforementioned benefits which are included in the room rate. That is not a complaint, by the way. Also, Canopy by Hilton hotel properties have no executive lounge. The hotel property has a fitness center, which I did not visit during my stay. 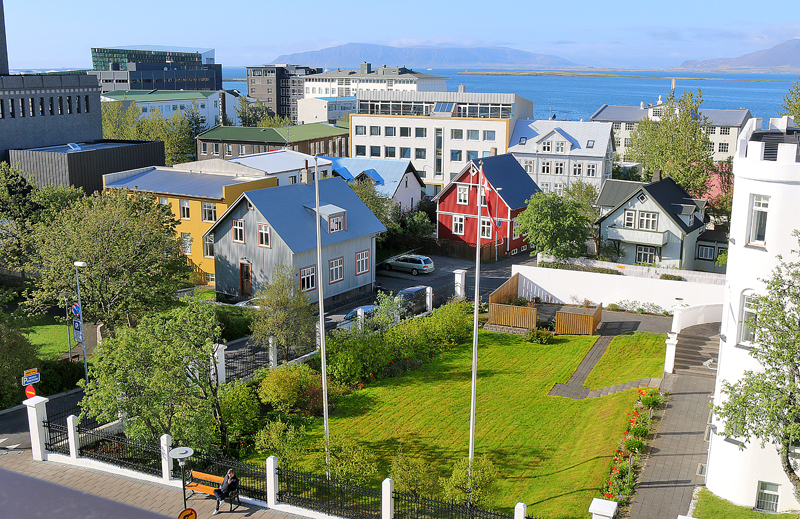 I paid a total of 27,905.50 Icelandic Krona or United States $271.59 for my stay of one night, which was a relative bargain — considering the cost of comparable lodging in Reykjavik — because it was a restricted rate which was paid in advance during a sale. Self-parking is available at an offsite garage 24 hours per day for 2,450.00 Icelandic Krona; but I was able to park on the street one block away without paying anything. I will detail how I did that in a future article. Valet parking costs 5,000.00 Icelandic Krona 24 hours per day. 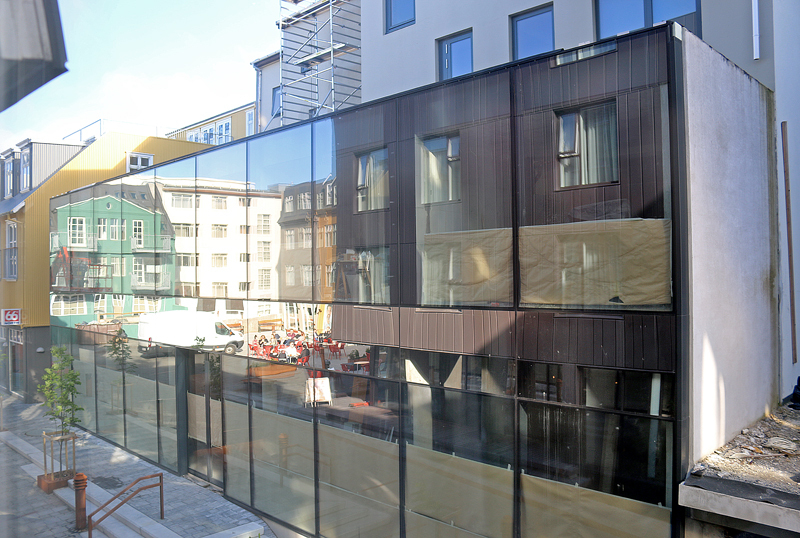 I would certainly consider staying at a Canopy by Hilton hotel property in the future — and since the grand opening of the Canopy by Hilton Reykjavik City Centre, seven other Canopy by Hilton hotel properties have opened: one in Croatia; and the remainder in the United States. I visited the Canopy by Hilton Washington DC The Wharf earlier this year and intend to post an article related to my experience. 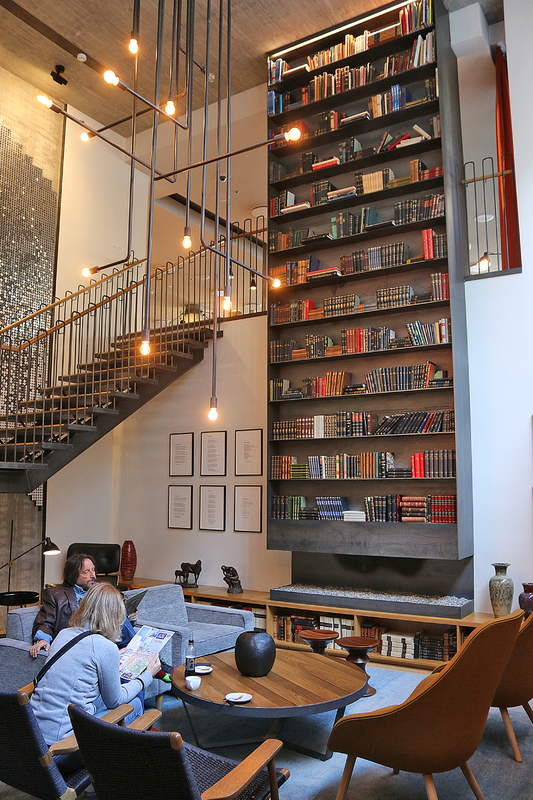 This looks exactly like a hotel created from millennial focus groups. The question is, are you willing to pay a premium for all the fluffy nonsense layered on? Personally, I want a nice roome, good breakfast, maybe nice pool or gym depending on where I am, but I don’t go to a hotel for a sense of community. What nonsense. And graffiti is jut street art? That’s a fine attitude if the property owner is OK with it, otherwise it is vandalism. How would you feel if I did a little street art on your car? Well, WR, all I can tell you is that when compared to other lodging options on the day of my stay in Reykjavik, the Canopy by Hilton was a bargain. It was even the least expensive of the other two options from Hilton — one of which I intend to review in a future article. I haven’t seen any follow-up article regarding parking at this hotel. I will be staying there for 5 nights soon with a rental car so I am very interested in how I can self-park for free! Thank you for the reminder, jasdou. I was going to include that in an article about driving in Iceland; but I now intend to write an article primarily on parking near that hotel property.